FedsEx are now actually 20% off! We all heard the news, Feds is back! Recently announced by GM specialist Ray Shero that Ruslan will be back in Pittsburgh for another year. He signed a 1 year deal worth $1.8MM. This shows some true character to come back for half the price of last year. What was he offered, we don't know just yet (maybe we won't know), but this does show that he wants to play here. I mean truthfully, who wouldn't want to be on Sid or Geno's line? Shero should have agents calling him left and right looking for a deal. In other news my good friend Aliza sent over this gem of a t-shirt. Happy 4th! I really got to buy one of them shirts. Happy 4th. This is a cool blog. Here in Halifax everyone was cheering for local Sidney to win it. It was a great final and enjoyable to watch. 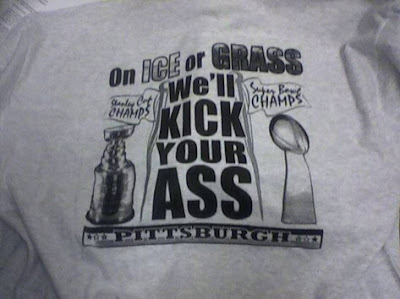 Love that Steelers/ Penguins shirt. I should try to get one too. Fedotenko is talented. A bit of an enigma. Some of my friends didn't like him and said he missed a lot of scoring chances for the number of times he was set up.